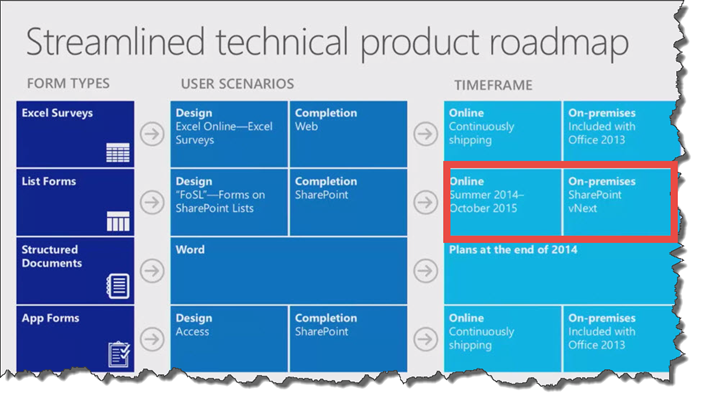 You are here: Home / InfoPath is back in SharePoint 2016 & FoSL vNext is dead! Last Friday afternoon, the SharePoint team at Microsoft made a few interesting changes on their blog about the future of Forms on SharePoint Lists (FoSL). 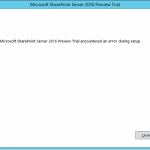 “As part of the update shared around the Evolution of SharePoint and the next SharePoint Server on-premises release, we are also updating the timelines for removal of InfoPath Forms Services components of SharePoint and SharePoint Online. Specifically, InfoPath Forms Services will be included in the next on-premises release of SharePoint Server 2016, as well as being fully supported in Office 365 until further notice. Customers will be able to confidently migrate to SharePoint Server 2016 knowing that their InfoPath forms will continue to work in their on-premises environments, as well as in Office 365. 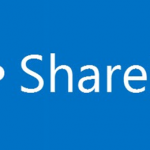 So, while it’s a good thing that InfoPath 2013 will work in SharePoint Server 2016, and will make migrations so much easier, a lot of SharePointers remembered that FoSL vNext was supposed to be released with SharePoint Server 2016 so Microsoft probably didn’t finish it in time. According to the roadmap, cancelled means: “Previously planned updates that are no longer being developed or are indefinitely delayed“. So while that doesn’t mean InfoPath 2013 will still be only option to edit forms until 2023, it does mean that a new version of FoSL will probably never arrive in SharePoint Server 2016, and we probably won’t see it in Office 365 in 2015. If you are curious to know how FoSL vNext was supposed to look like, here are some screenshots from SPC348. 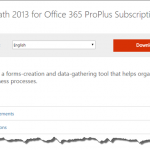 So, even if there was an InfoPath Funeral at SPC14, InfoPath is now back from the dead and will probably be the only way to customize Forms on SharePoint Lists in SharePoint 2016. I really hope we will be able to learn more at the Microsoft Ignite conference this year in Chicago. Meanwhile, if you’re looking for an InfoPath alternative that works with any version of SharePoint and uses mobile apps to fill forms, you might take a look at third-party vendors such as Formotus. Excellent overview Vlad. I was also appalled that the much-touted FoSL was ditched although the signals were there (no news whatsoever). Now, I’m looking at Lightswitch going the same way. Sad…. Not actually “back”, as it was never really gone, but not gone yet. Thanks for the heads-up. Late in 2013 a Microsoft rep referred us to a national insurance client as a “better option than InfoPath”. Although I agreed and was grateful, I didn’t understood why. Then we saw last year’s news and it all made sense. Then this news and it feels like just more of the same. Great opportunity for ISVs like Xpertdoc, though! I’d done a session at the Australian+NZ SPC about ‘forms futures’. I didn’t hold much hope for FoSL…! We mainly look to Nintex Forms or AngularJS – instead of InfoPath. Great concise post. I hope that the guys in MS clarify the situation as any ambiguity can affect business or strategic decisions. Especially as in places where it’s one of the portfolio of features on the cards – which are being sold to a business. I always see InfoPath / a forms service (i.e. FoSl) as a sleeper hit in any enterprise – as some enterprises just see SharePoint as a Intranet Landing Page. Once the ball starts rolling with forms on a few Proof of Concepts, then the rest just snowballs. If you have a situation with ‘No new features’ or updates means the product is stagnant or set to be cancelled / abandoned then, the alternatives fork the solution stack away from Microsoft. FYI – Formotus is not the only alternative to InfoPath alternatives – check out ClaySys AppForms! I have a comparison of products worksheet that I am happy to share with anyone that wants it. I would very much love this if you can possibly share. I don’t think it exists… I emailed her for it but no answer. Excellent summation Vlad. Some cause for optimism for the future of InfoPath. Dhileep – where should I send the .pdf comparison doc to? Hi Susan, would it be possible to receive a copy of the comparison doc? Would be great, I’m also searching for a responsive Infopath alternative. I actually don’t know how to share my mailadres without that it’s being published in this post…..? Help? A new web based forms editor would have gone a long way towards addressing the massive gaping hole in the the SharePoint product which is custom forms. This would have been a very compelling reason for organizations to upgrade to 2016. Now were told to go back to using Infopath? what a joke. Heh. InfoPath was a complex, elegant framework. The designer still needed some work, but it was 95% of the way there. I’ve always believed that it was a victim of “NIH Syndrome” – some new PM and team moved in, and they felt the XML framework underneath InfoPath forms was just “too hard” so they tossed it and started over, because how hard can it be to design a form technology? This latest news shows they ran head-on into how hard it is. I know this is an old post, but I’m having trouble getting an answer to a simple question. The post says clearly, “Specifically, InfoPath Forms Services will be included in the next on-premises release of SharePoint Server 2016”. Can anyone confirm for me whether this means both Standard and Enterprise editions, or just Enterprise?